These are the classic original Monster trucks of the 80's, the Monster Trucks I grew up with. 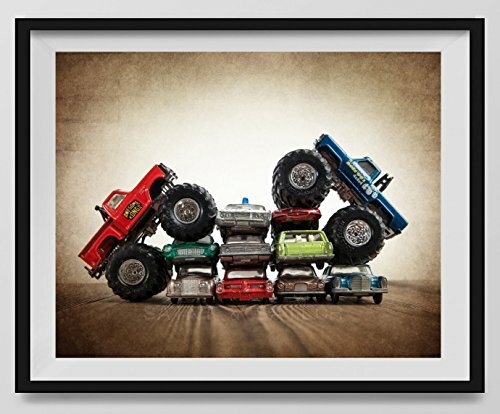 I created this art for the kid who loves Monster trucks but whose mom wants to keep the decor cool, unique and vintage. This is an unframed fine art photo print. All my photos are printed with love on premium finish Kodak Endura Lustre photo paper that won't curl or yellow over time. These are real photographs, not inkjet prints. It will be shipped safely to you in rigid and moisture resistant packaging. SIZES available (Above choose "select options" button then "select size"): 8x10, 11x14, 16x20, 20x24, 24x30, 30x40) Orientation: Landscape All photos listed for sale in this store have been taken and edited by me. All ordered prints will come without the watermark and are unframed. All photos are made to order in the U.S. It generally takes 1-3 business days to print then will ship right out to you.